A multihull is a ship, vessel, craft or boat with more than one hull. The Royal Motor Yacht Club – Broken Bay, at Newport, has a Multihull Division that comprises both catamarans and trimarans ranging from 24 to around 45 feet. The Division sails on the magnificent waters of Pittwater and Broken Bay, Sydney, Australia. This year is the 21st Anniversary of the Multihull Division and to celebrate we thank Alan Brand in helping us put together a celebratory insight into these magnificent fliers and what the RMYC Multihull Division does. When did the RMYC Multihull Division begin? To enable multihull enthusiasts to enjoy the facilities, services and organised racing offered by the RMYC. 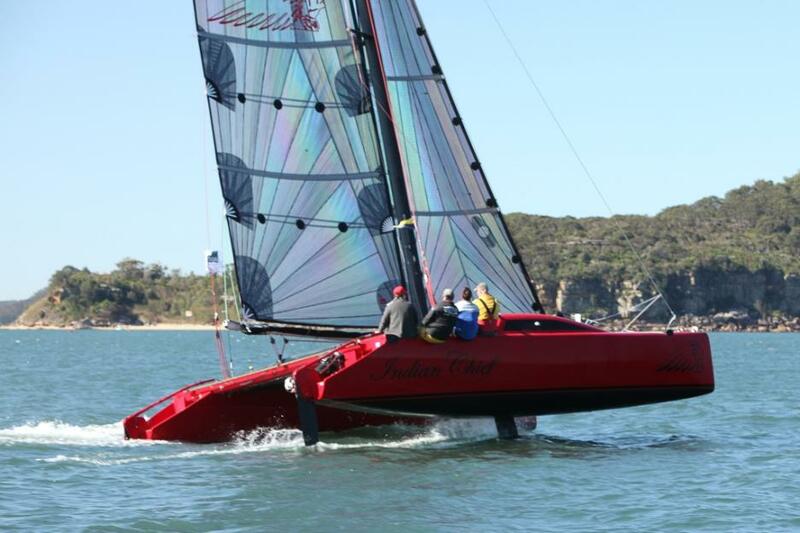 There was only "informal" racing of multihulls on Pittwater prior to this. What are some of the activities that have been offered during this time? The group races most Saturdays throughout the year, conducts social picnic days and welcomes anyone with an interest in multihull yachts - whether that interest is in racing or cruising - to join us for a sail at any time, register for a crewing position or just turn up for a chat. We are always happy to share our knowledge and experience with newcomers to multihull sailing. Our current Saturday racing fleet comprises both catamarans and trimarans ranging from 24 to around 45 feet and includes designs from the boards of Ian Farrier, Tony Grainger and Lock Crowther. This fleet focuses mainly on round-the-buoys racing. The Monday evening twilight racing series hosted by the RMYC Sailing Division during daylight saving is especially popular with multihullers and represents a very relaxed and enjoyable introduction to the pleasures of multihull sailing. How may be people get involved or become members? In the first instance contact the RMYC office on 9997 5511. What is coming up for the RMYC Multihull Division? A major event in our calendar is the hosting of the Lock Crowther Multihull Regatta on the October long weekend. This regatta is dedicated to the memory of Lock Crowther - one of Australia's foremost multihull designers. Hosted by the RMYC since 1996, the Lock Crowther Multihull Regatta includes both inshore races and an ocean race for suitably equipped boats. The Regatta typically attracts many of Australia’s fastest multihulls, as well as cruisers, for three days of fabulous fun both on and off the water. Sponsors’ prizes are awarded at a sumptuous Regatta dinner for places in Racing, Cruising and OMR divisions. Arguably Australia's most friendly, fun Regatta! What is the RMYC Multihull Division favourite place in Pittwater and why? We always enjoy our picnics at Lobster Beach on the edge of Bouddi National park but there are so many magnificent spots in Pittwater it's hard to choose! What is the RMYC Multihull Division’s motto? Sail safely. Respect others. Have fun! One of our objectives is to develop and encourage the sailing of Multihull yachts in a safe and friendly manner, building camaraderie between the Division’s Members and all those interested in Multihull sailing. 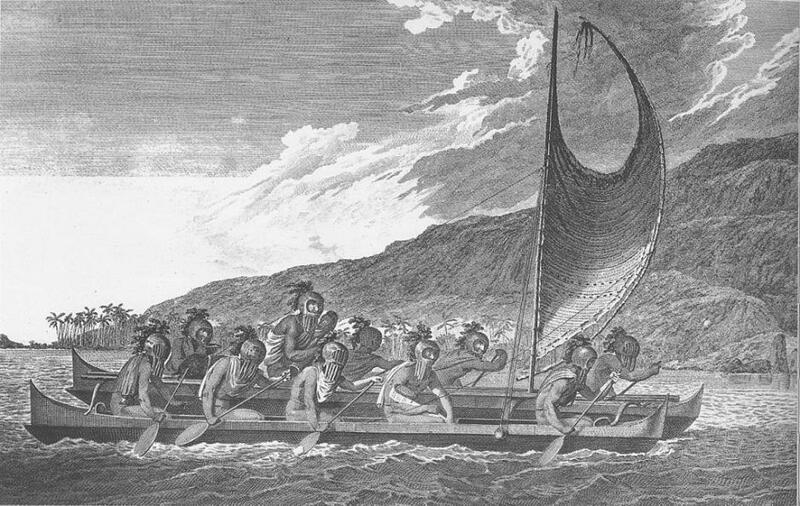 Priests traveling across kealakekua bay for first contact rituals - Artist: John Webber, artist aboard Captain Cook's ship (1778). Catamarans and Trimarans have been around for thousands of years. The larger Hellenistic polyremes ("sixteens", "twenties", "thirties" and one "forty") were most likely double-hulled catamarans. Two such super-galleys built by the Ptolemaic king Ptolemy IV (221–205 BC) have come down to us by name, the Thalamegos and the Tessarakonteres. While the English adventurer and buccaneer William Dampier was travelling around the world in search of business opportunities, he found himself on the south-western coast of India. He was the first to write in English about a kind of vessel he observed there. It was little more than a raft made of logs. On the coast of Malabar," he wrote in 1697, "they call them Catamarans. These are but one Log, or two, sometimes of a sort of light Wood ... so small, that they carry but one Man, whose legs and breech are always in the Water. The vessels described by Dampier are still in use today on the coasts of South India. "kattumaram" literally means logs tied together. Today's kattumarams have about four logs tied together in a shallow arc to make a raft. The logs are usually from a local, fibrous palm tree. Typically the raft is untied and logs are scattered to dry out before reuse. Although the name came from Tamil, the one-hull-ballasted sailboat variant is from South Pacific. English visitors applied the Tamil name catamaran to the swift, stable sail and paddle boats made out of two widely separated logs and used by Polynesian natives to get from one island to another. Early modern Europe's first documented catamaran was designed by the polymath and Royal Society member William Petty in 1662. It was designed to sail faster, in shallower waters, with less wind & crew than other vessels of the time, but the unusual design met with scepticism and was not a commercial success. The design remained relatively unknown in the West for almost another 160 years, until the 1820s or 1830s, when Englishman May Flower Crisp built a two-hulled merchant ship called "Original" at Rangoon. Crisp described it as "a fast sailing fine sea boat; she traded during the monsoon between Rangoon and the Tenasserim Provinces for several years". Later American Nathanael Herreshoff began to build catamaran boats of his own design in 1877 (US Pat. No. 189,459), namely Amaryllis, which immediately showed her superior performance capabilities, at her maiden regatta (The Centennial Regatta held on June 22, 1876, off the New York Yacht Club's Staten Island station). It was this same event, after being protested by the losers, where catamarans, as a design, were barred from all the regular classes and they remained barred until the 1970s. This ban relegated the catamaran to being a mere novelty boat design for many years. In 1936 Eric de Bisschop built a Polynesian "double canoe" in Hawaii and sailed it home to a hero's welcome in France. In 1939, he published his book Kaimiloa,which was translated in English in 1940. In 1947, surfing legend, Woodbridge "Woody" Brown and Alfred Kumalae designed and built the first modern ocean-going catamaran, Manu Kai, in Hawaii. Their young assistant was Rudy Choy, who later founded the design firm Choy/Seaman/Kumalae (C/S/K, 1957) and became a fountainhead for the catamaran movement. The Prout Brothers, Roland and Francis, experimented with catamarans in 1949 and converted their 1935 boat factory in Canvey Island, Essex (England), to catamaran production in 1954. Their Shearwater catamarans won races easily against the monohulls. Yellow Bird a 1953-built Shearwater, raced successfully by Francis Prout in the 1960s, is in the collection of the National Maritime Museum Cornwall. Inspired by de Bisshop's Kamiloa, in 1955 James Wharram built a utilitarian catamaran and sailed across the Atlantic with a crew of two German girls. In Trinidad he built another one and returned via the North Atlantic, west to east, pioneering catamaran cruising (maritime). Currently, most individually owned catamarans are built in France, South Africa, and Australia. In 1970 Les Thompson began work in Inverloch, Australia, to single-handedly build the Llinase, a 70-tonne, 24 meter steel ketch motor-sailer which was subsequently launched in 1980. The vessel was able to "walk" up any suitable beach using a shunting system located under the wing and powered by hydraulic rams. In the mid-twentieth century, the catamaran inspired an even more popular sailboat, the Beach Cat. In California, a maker of surfboards, Hobie Alter produced the 250-pound Hobie 14 in 1967, and two years later the larger and even more successful Hobie 16. That boat remains in production, with more than 100,000 made in the past three decades. The Tornado catamaran was an Olympic class sailing catamaran since 1976, with a crew of two. It was designed in 1967 by Rodney March of Brightlingsea, England, with help from Terry Pierce, and Reg White, specifically for the purpose of becoming the Olympic catamaran. At the IYRU Olympic Catamaran Trials, it easily defeated the other challengers. Important builders of transport catamarans are Austal and Incat, both of Australia and best known for building large catamarans both as civilian ferries and as naval vessels. Lock Crowther - a famed multihull designer of Australia. Among his most notable designs were the Buccaneer & Kraken series trimarans, Spindrift 45 & Catana 40 cats, as well as a great number of other cruising, racing, charter/commercial and power cats and tris. Lock Crowther built his first boat, a trimaran called BUNYIP, in 1959 while still a teenager. The following year he raced in the Easter regatta at Paynesville, Victoria, Australia, beating 300 boats to the finish. The success of his boat inspired several of his friends to build similar boats and thus Lock Crowther’s design career started, though he did not expect to make a living out of it, and studied electrical engineering. In the early 1960s, when there were only a handful of people designing multihulls, Lock Crowther was involved in this international scene and also a member of the Amateur Yacht Research Society. – Courtesy Old Sailor. Copyright Royal Motor Yacht Club - Broken Bay - Multihull Division, 2014.